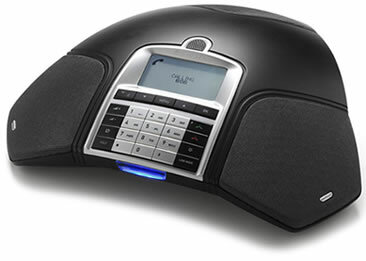 The world’s only mobile conference phone that delivers better audio quality than landline. The 300Mx is based on Konftel’s OmniSound® audio technology and supports HD Voice in the mobile network. The crystal-clear and natural sound allows the nuances of conversation to come through, making dialogue more fluid. The Konftel 300Mx is perfect for companies that have chosen a mobile communications solution or need to supplement landline systems. Insert the SIM card and start your meeting immediately, with no fuss or cables. The battery provides up to 30 hours of talk time and is charged when the Konftel 300Mx is placed on the accompanying charging cradle. This mobile conference phone is also useful for PC and web-based meetings thanks to its USB connection. The Konftel 300Mx is ideal for use with tools such as Skype for Business, Cisco Jabber and Avaya’s UC suite. Use line mode to switch smoothly between and combine mobile and USB connections. Other useful features include the ability to record to an SD memory card, SMS and the conference guide that helps you save call groups, which is a huge help if you make regular multi-party calls. With the Konftel 300Mx you can hold virtual meetings anywhere at any time. Connect expansion microphones for clear and distinct audio from up to 20 people with no effort.